I was provided these pencils at no charge by DOMS for review purposes. 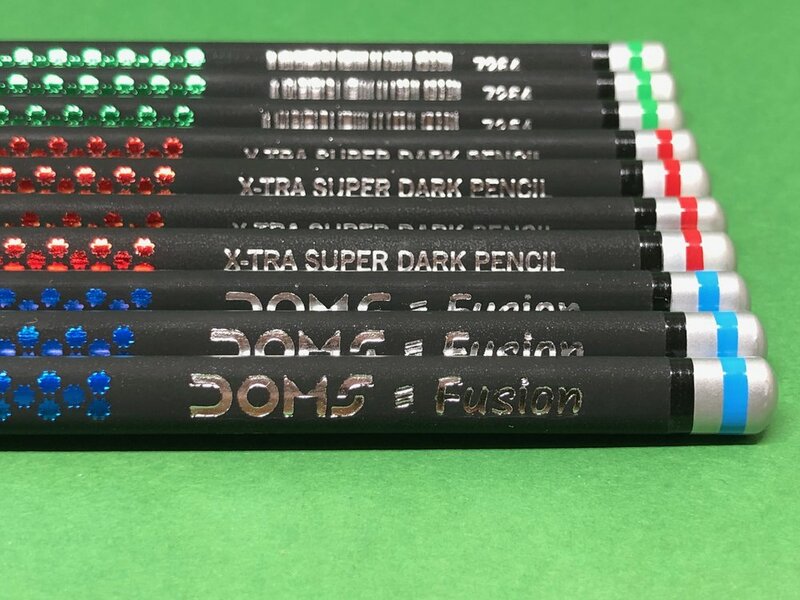 DOMS has been one of my favorite pencil brands since I discovered them a few years back. They're owned by F.I.L.A., who owns Ticonderoga, Lyra, Prang, and a whole host of other stationery brands. To me, they beat out the Hindustan brands Nataraj and Apsara in manufacturing quality and general performance. Every DOMS pencil I've used has been really well made and hasn't had a lot of manufacturing defects, like messed up paint, crooked ferrules, or wildly off-centered cores. While I like most of them, I can't say the same about Hindustan's offerings. The Fusion pencil was unreleased when DOMS sent these to me last year. Unfortunately, I got them right as I was scaling back on posting for a while and never got around to them. They have since been released, but only in India. I haven't seen them anywhere else online except for Amazon India, and when I reached out to DOMS to inquire where my US readers might be able to buy them, they said they were looking into getting them on Amazon in the US. I'm fairly certain The Curios will have the Fusion, since I've seen them on their Facebook page from last year, so if you've bought from them before, you should be able to purchase these if interested. Onto the pencil: The Fusion is something of an odd duck in the DOMS lineup. It's a black triangular pencil that has a soft rubbery finish. I like that part about it a LOT. 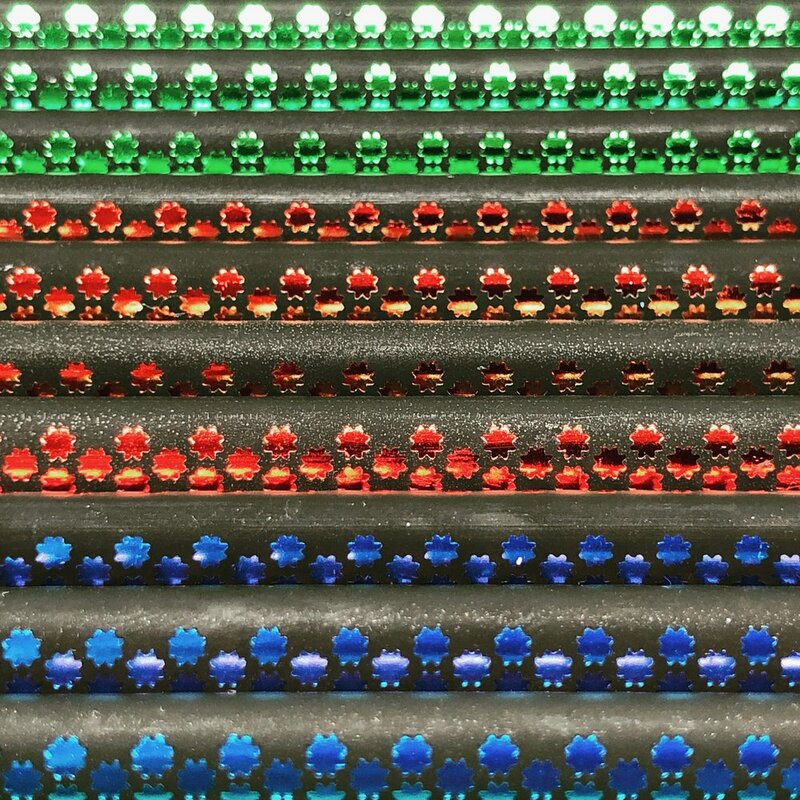 But they put 3 different foil stamp colors on each side, green, blue, and red, in a pattern of stars which is supposed to help grip? I don't know. I do know that the stamp flakes off fairly easily. 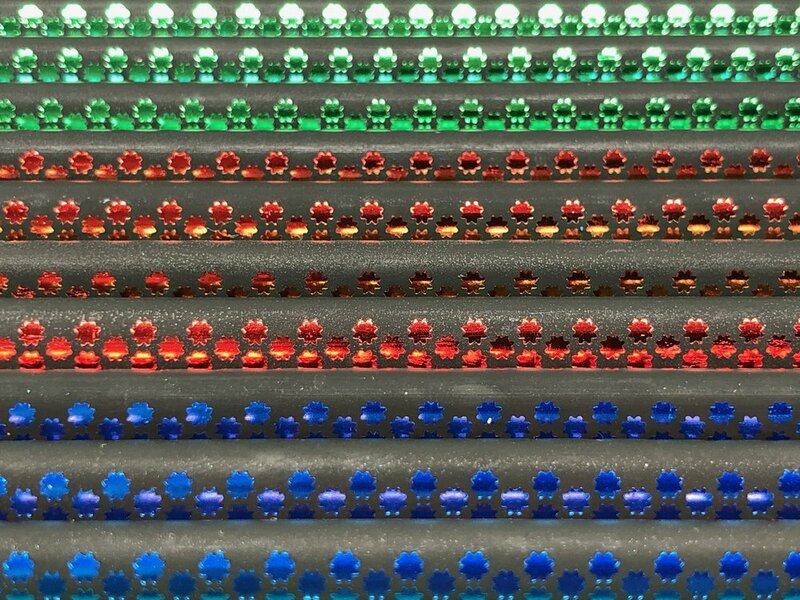 Each end is dipped in a silver paint with a colored stripe, either red, green, or blue. There are ten in a pack, so you get an extra of one of the colors. I'm thinking maybe they should've matched the end dip stripe with the foil stamp and only did one color of foil. Then you could have a pencil that is black and one other color instead of black and 3 rainbow colors. Near the top of the pencil, they do a silver foil stamp of the DOMS logo, the UPC, and the grading on each side, which in this case is "X-TRA SUPER DARK". I'll never know the true grade of this pencil, but it is dark and soft. It has a thick core, which I love. And in true DOMS fashion, it is well-centered. I would say it's close to a 2B or 3B. If you write with a heavy hand like I do, the point retention isn't the greatest, but if you keep it light, it's not bad. With my heavy hand, I can get it looking Sharpie dark if I want to press just a bit harder. The core seems strong, and doesn't give me the feeling that it might snap if I press super strong to make a thick dark line. Grading is all over the place between brands and even country of orgin, as you know, and a German 2B is close to a Japanese HB and maybe the Indian pencil manufacturers are smart to keep those grades off their pencils so there won't be some preconceived notion about what you're getting. DOMS says you're getting an Xtra Super Dark pencil, and yeah, you are. Carl CP-80 vs short point Erasner. Of course, the box comes with something extra, because that's the best part of Indian pencil brands...you always get something fun inside. They have included a small ruler called the Crystal Scale and an eraser/sharpener combo called the Erasner. The sharpener part makes a fairly short point, and the eraser is good. I probably won't use the sharpener, but in a pinch, there are worse out there. I just don't really like short points. Overall, these are nice pencils, design choices aside. They've made 2 versions of the same pencil before, like the Zoom, and I would love a different version of this Fusion pencil without the foil stamping in the grip area. The matte black rubbery coating is really nice and I think they didn't need the foil at all. 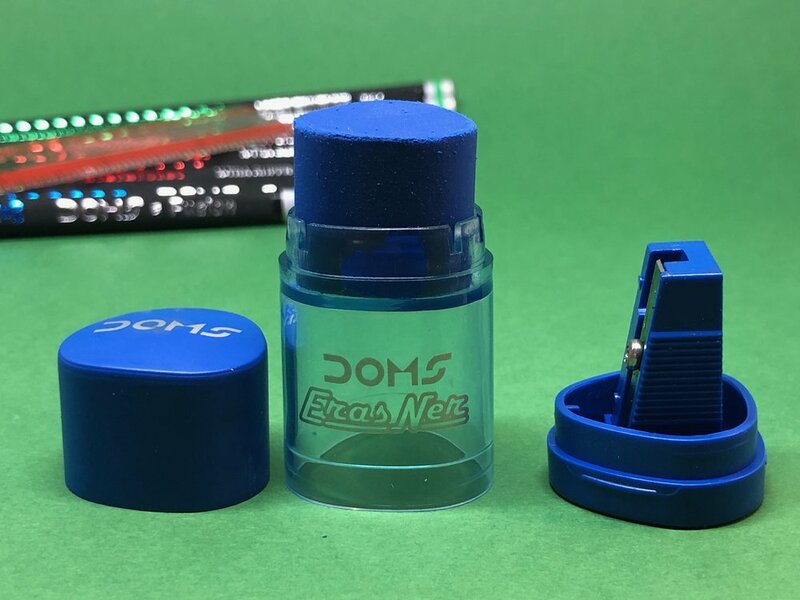 I'm not sure exactly the price, but with the general price of DOMS pencils, I can't see these being super expensive. The Amazon India listing I found had 5 10-packs for around $5. Again, Indian pencils are a steal.